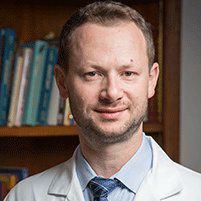 Dr. Maxim Tyorkin is a leading orthopedic specialist dedicated to providing patients in New York City with the most advanced care for musculoskeletal diseases, injuries and disorders. With two practices serving both the Upper East Side in Manhattan and Forest Hills, Queens, Dr. Tyorkin offers customized care and treatment based on each patient's individual medical needs, health history and lifestyle for the most effective care and fast, long-lasting results. After earning his undergraduate degree in biology at Binghamton University and his M.D. At Mount Sinai School of Medicine in New York City, Dr. Tyorkin completed an internship in general surgery and a residency in orthopedic surgery at Stony Brook University, followed by a fellowship in sports medicine and arthroscopic surgery at Southern California Orthopedic Institute in Van Nuys. Certified by the American Board of Orthopaedic Surgery, Dr. Tyorkin is skilled in diagnosing and treating a broad range of musculoskeletal injuries and diseases, including conditions affecting the hips, shoulders, knees, elbows, wrists and ankles. His in-depth understanding of sports injuries helps him develop the most comprehensive treatment plans for all sorts of injuries to joints, ligaments, tendons and other soft tissues so recreational and professional athletes can return to their sports as soon as possible. He also has a wealth of experience treating occupational injuries, age-related diseases such as arthritis, and traumatic injuries sustained in car accidents and slip-and-fall accidents. Dr. Tyorkin believes strongly in patient education, and works with each patient individually to address their concerns, answer their questions and understand their expectations so he can develop the most appropriate course of care, from conservative management to surgical treatment when necessary. His experience in leading hospitals and medical centers enables him to use the safest, most advanced state-of-the-art techniques available for optimal results. Dr. Tyorkin is committed to expanding his knowledge and mastery of novel diagnostic and treatment techniques in orthopedics and maintains memberships in several professional organizations, including the American Medical Association (AMA), the American Orthopaedic Society for Sports Medicine (AOSSM) and the Arthroscopy Association of North America (AANA). During his time away from work, Dr. Tyorkin stays involved with the community to help build strong ties and support local businesses and organizations. As a trained specialist of sports medicine and arthroscopy I treat a myriad of shoulder, hip, knee, elbow and ankle injuries. Specific rehabilitation for these injuries and disorders are prescribed and supervised by myself as the treating physician. Most injuries can be treated non-operatively, but when surgery is necessary, arthroscopic small incision techniques are generally utilized. These techniques allow for quicker recovery, less pain, and improved cosmesis. Before a treatment plan is implemented, I believe patients should be fully educated about their condition, so that they may participate in the decision-making process. Each patient has different functional demands and lifestyle expectations, and treatment should be tailored to meet each patient's individual needs. When surgical treatment is indicated, I take the time to explain the risks and benefits of surgery to each patient. It is very important for the patient to understand the details of the rehabilitation process, as well the expected outcome after surgery. My practice is in the same community where my family and I live. So, it is very important that I remain active in the community. Super Doctors identify top doctors. Dr. Tyorkin has been named Rising Star twice in 2013 and 2014 and as a top provider by Super Doctors. Click here to view Dr. Tyorkin's Super Doctors profile. We are always accepting new pateints. We accept most major insurance plans, Medicare, and Worker's compensation. If you any questions, please call one of our office locations.